This example is a well known benchmark test case from structural mechanics, a thin plate with a circular hole in the center is subjected to a load and stretched along the horizontal axis. The plate is thin enough to satisfy the two dimensional plane stress approximation, and since both the problem and solution will be symmetric around the hole it is enough to model a quarter of the plate. The computational geometry here therefore consist of a 0.05 by 0.05 m square with a quarter of a circle with radius 0.005 m removed from one corner. Due to the symmetry the displacement of the left edge of the plate should be zero in the x-direction, and similarly the y-displacement for the lower edge should also be zero. Furthermore, a horizontal force of 1000 N is applied to the right edge. With a plate thickness of 0.001 m, the resulting load will be 1000/(2·0.05·0.001) N/m2. Assuming that the plate is made of steel with a Poisson ratio of 0.3 and modulus of elasticity 210·109 Pa then it is expected that the maximum stress in the x-direction will be three times the stress of a plate without a hole, that is σx = 3·1000/(2·0.05·0.001) = 3·107 Pa . The computed stress along the left side vertical boundary is compared against the theoretical reference results in the figure, clearly showing very good agreement. How to set up and solve the thin plate with hole example with the FEATool graphical user interface (GUI) is described in the following. Alternatively, this tutorial example can also be automatically run by selecting it from the File > Model Examples and Tutorials > Quickstart menu. 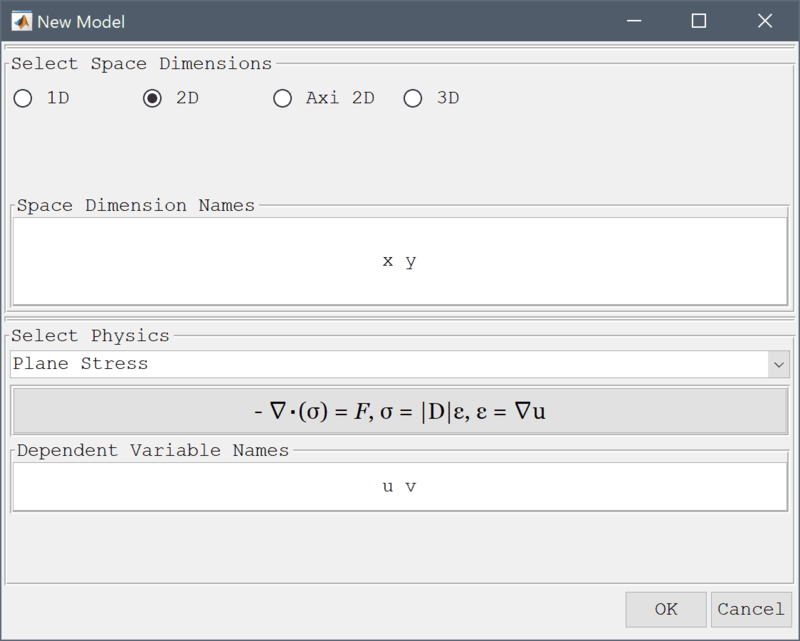 In the New Model dialog box, select 2D for the Space Dimensions, and select Plane Stress from the Select Physics drop-down menu. Leave the space dimension and dependent variable names to their defaults and press OK to finish the physics mode selection. The geometry of the plate can be created by first making a square for the base, and subtracting a circle from the lower right corner. 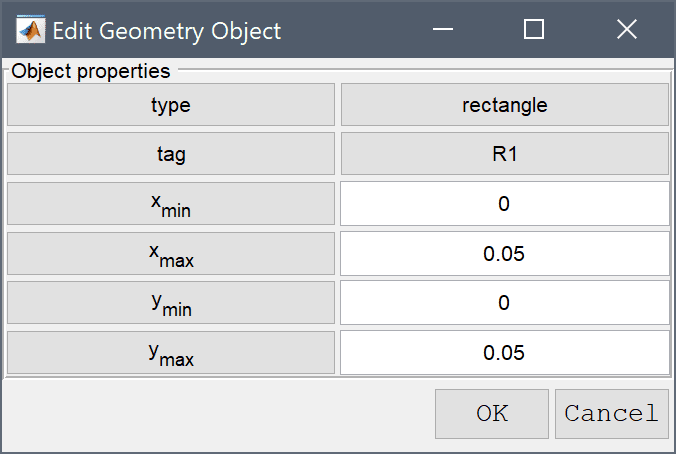 The geometry object properties must now be edited to set the correct size and position of the rectangle. To do this, click on the rectangle R1 to select it which highlights it in red. Then click on the Inspect/edit selected geometry object Toolbar button. 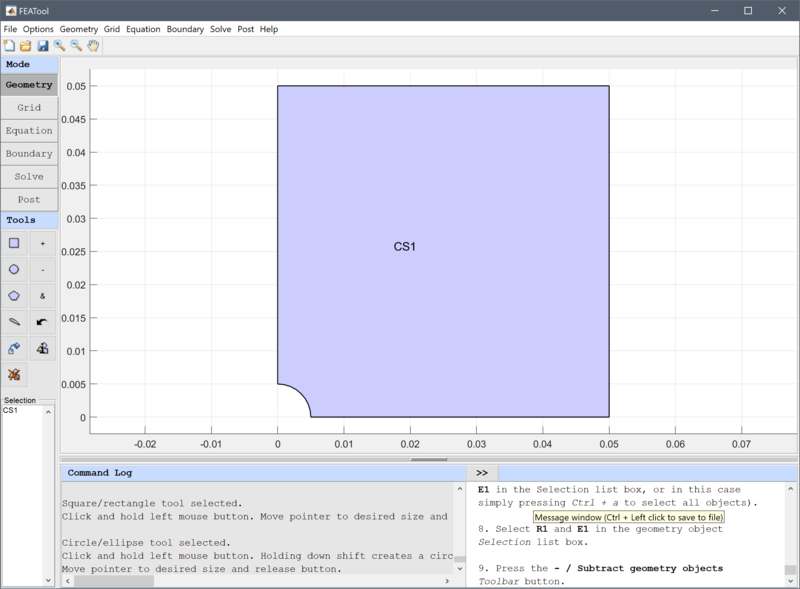 In the Edit Geometry Object dialog box, change the x/ymin and x/ymax point coordinates to define a rectangle with length and height 0.05 and lower left corner at the origin (0, 0). Finish editing the geometry object and close the dialog box by clicking OK. The object properties of the ellipse E1 must be changed to make a circle with radius 0.005 centered at (0, 0). 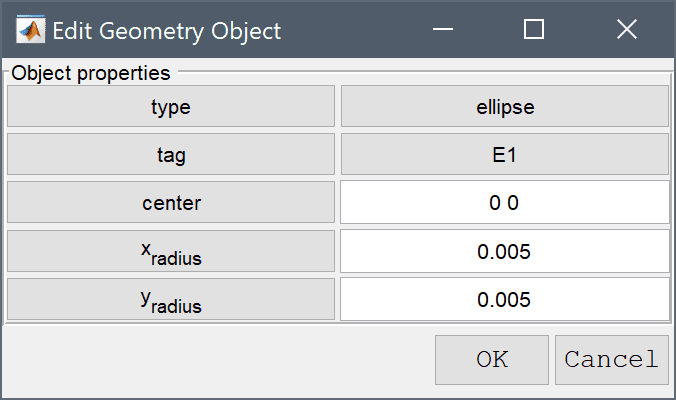 Click on the ellipse E1 to select it and highlights it in red, and use the Inspect/edit selected geometry object tool to set the center and radius. To subtract the circle from the rectangle first select both geometry objects by clicking on them so both are highlighted in red, and then click on the - / Subtract geometry objects button. (Alternatively, if the circle is obscured by the rectangle they can be selected by holding the Ctrl key while clicking on the labels R1 and E1 in the Selection list box, or in this case simply pressing Ctrl + a to select all objects). Enter 0.001 into the Grid Size edit field. Press the Generate button to call the automatic grid generation algorithm. Equation and material coefficients are be specified in Equation/Subdomain mode. 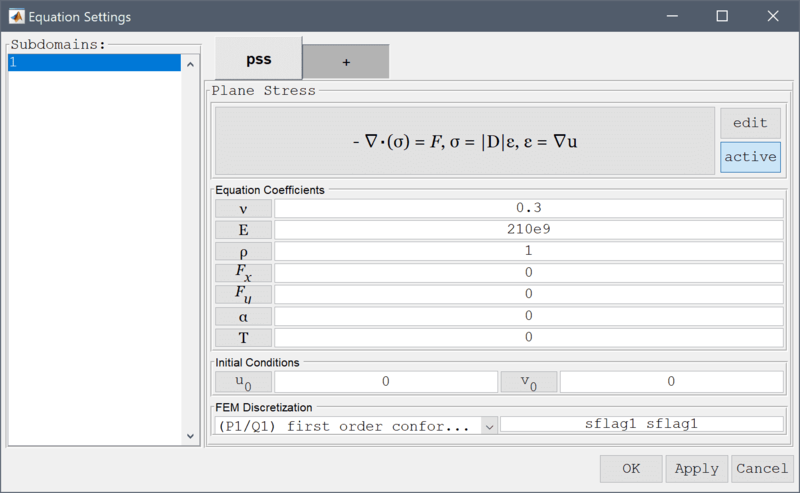 In the Equation Settings dialog box that automatically opens, enter 0.3 for the Poisson's ratio and 210e9 for the Modulus of elasticity. The other coefficients can be left to their default values. Press OK to finish the equation and subdomain settings specification. Note that FEATool works with any unit system, and it is up to the user to use consistent units for geometry dimensions, material, equation, and boundary coefficients. 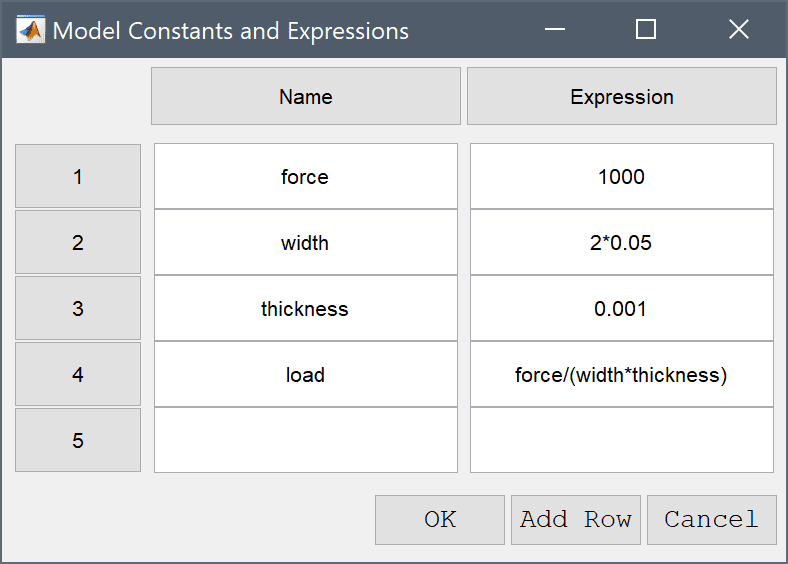 In order to define an expression for the load force, press the Constants Toolbar button, or select the corresponding entry from the Equation menu, and enter the following variables in the Model Constants and Expressions dialog box. 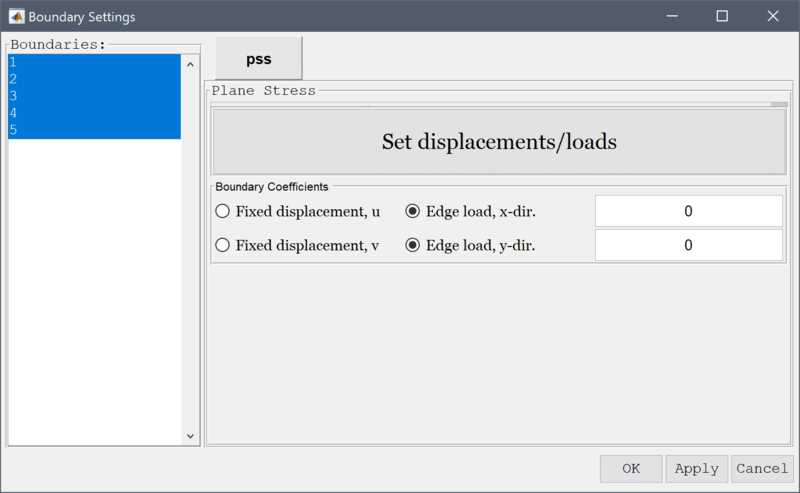 In the Boundary Settings dialog box, first select all boundaries and set all conditions to Edge loads with a value of zero 0 (The selected boundaries will be shown highlighted in red). 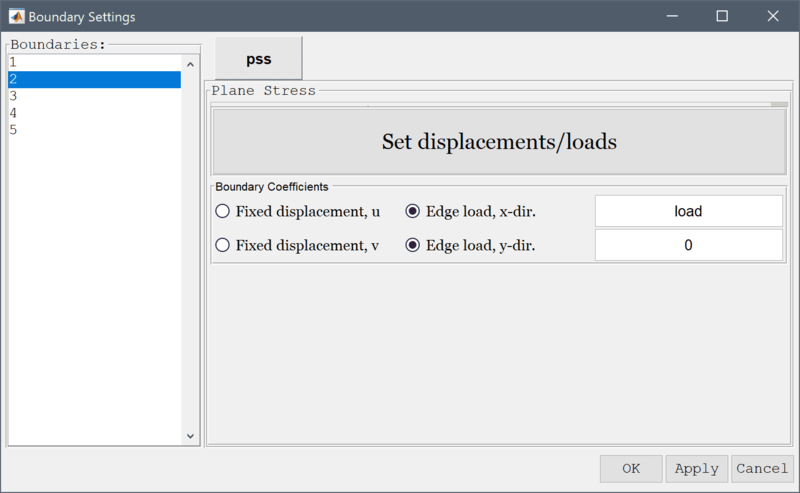 Then select the left boundary in the left hand side Boundaries list box (number 4), and select Fixed displacement, u and zero Edge load, y-dir. This will fix the displacement in the x-direction for this boundary. Continue by selecting the bottom boundary (number 1), and choose the zero Edge load, x-dir and Fixed displacement, v boundary conditions. This similarly fixes the lower boundary. Lastly, select both Edge load boundary conditions for the right boundary (number 2). Set the edge load in the x-direction on this boundary to the previously defined load expression. Finish the boundary condition specification by clicking the OK button. Now that the problem is fully specified, press the Solve Mode Toolbar button to switch to solve mode. Then press the = Tool button to call the solver with the default solver settings. 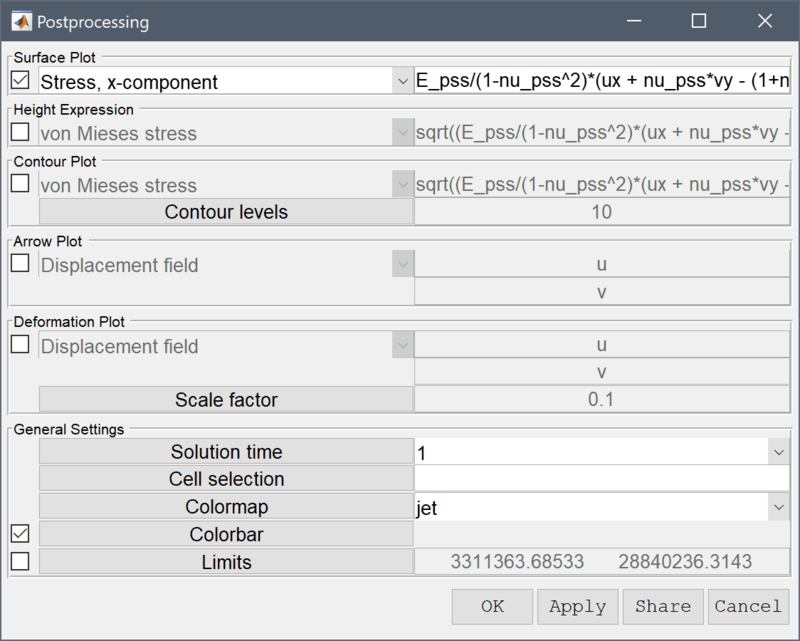 After the problem has been solved FEATool will automatically switch to postprocessing mode and here display the computed von Mieses stress. To change the plot, open the postprocessing settings dialog box by clicking on the Plot Options Toolbar button. 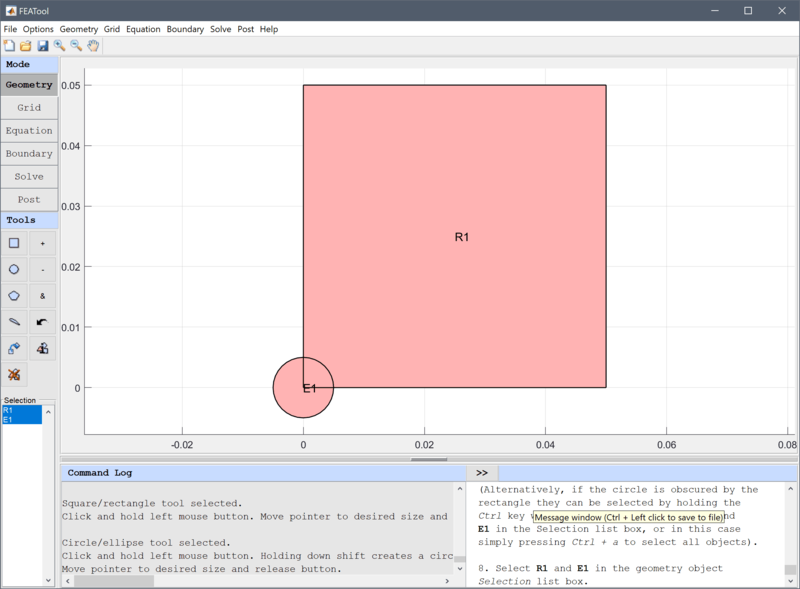 One can evaluate and find the value of a plotted expression by directly clicking on the surface plot. 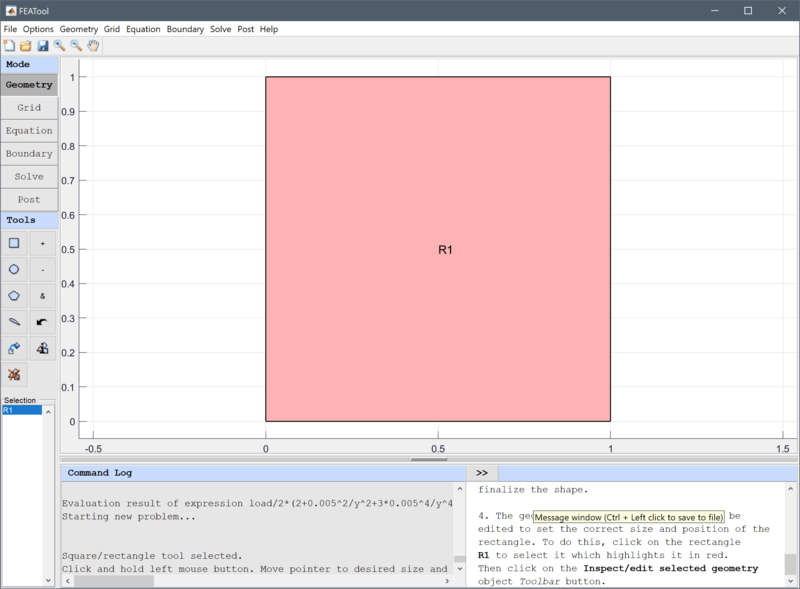 Alternatively, the Min/Max Evaluation postprocessing tool can be used to find the maximum tangential stress. Select Min/Max Evaluation... from the Post menu. 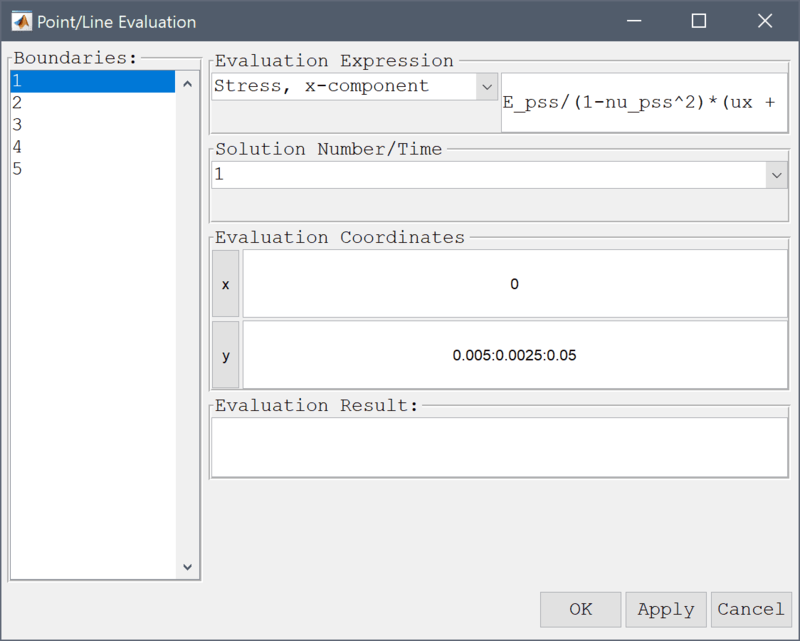 Select Stress, x-component from the Evaluation Expression drop-down menu. Press OK or Apply to calculate and show the minima and maxima. From the result one can see that the maximum value of the tangential stress is close to 3·107 Pa which is in full agreement with the expected solution. The stress along the left symmetry axis can also be plotted with the Point/Line Evaluation feature and compared with the equivalent of the analytical solution F/A/2*(1+r2/y2+3*r4/y4). Enter 0 into the Evaluation coordinates in x-direction edit field. Enter 0.005:0.0025:0.05 into the Evaluation coordinates in y-direction edit field. 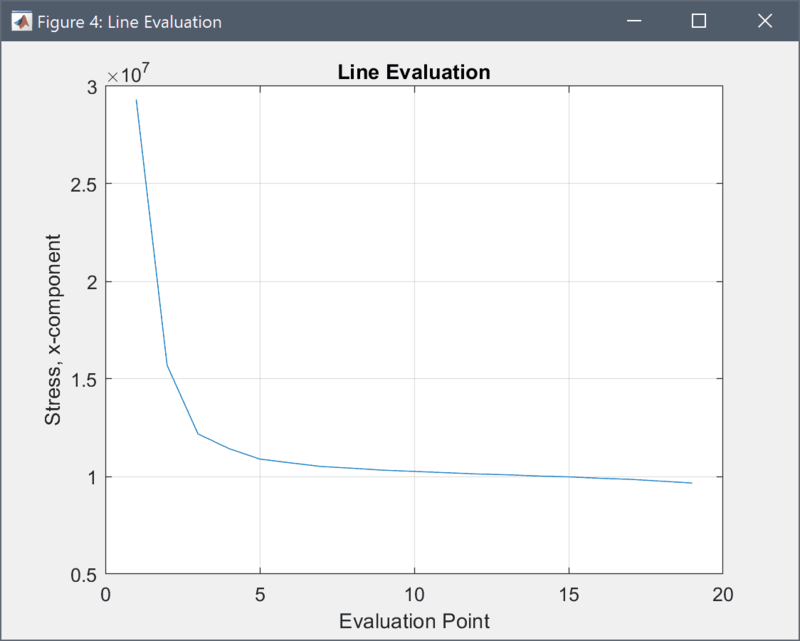 Press the Apply button to create the line plot. 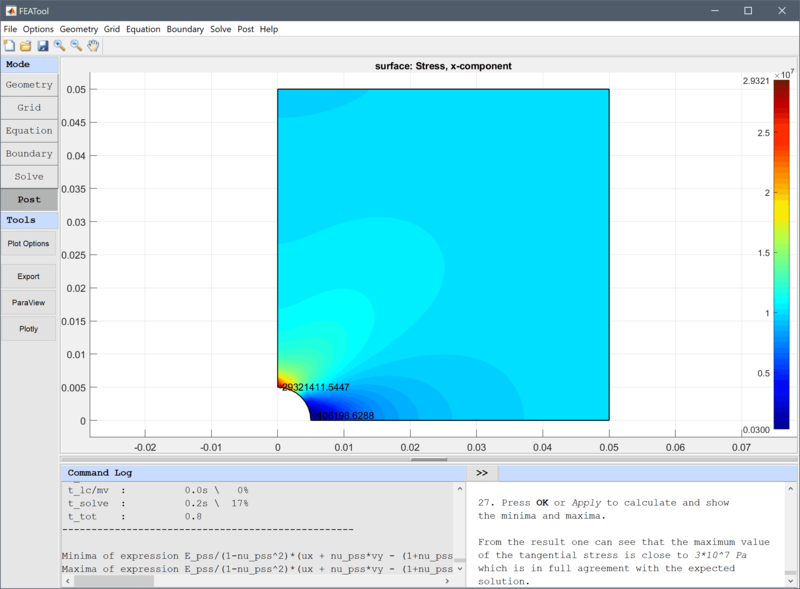 To plot the analytical reference expression enter load/2*(2+0.005^2/y^2+3*0.005^4/y^4) into the edit field. The computed and analytical stress curves will conincide as expected. Press OK to finish and close the dialog box. 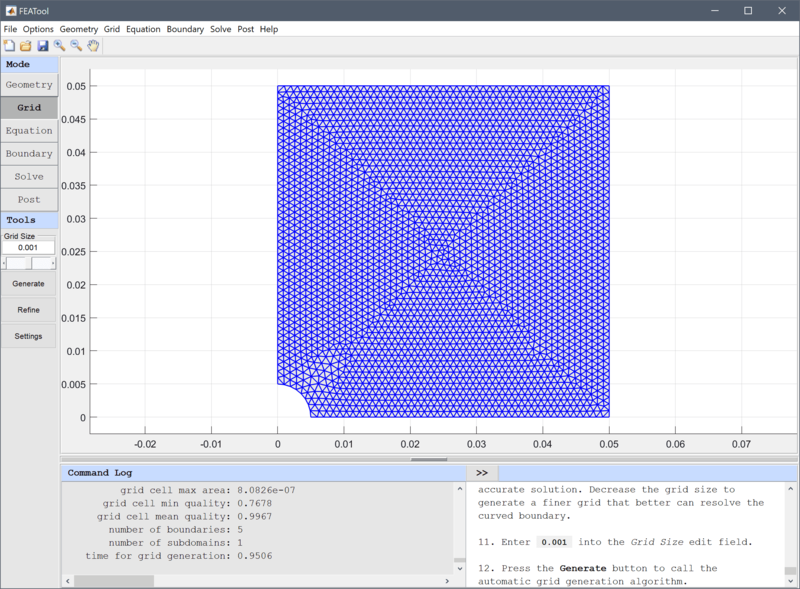 The thin plate with a hole structural mechanics model has now been completed and can be saved as a binary (.fea) model file, or exported as a programmable MATLAB m-script text file, or GUI script (.fes) file. Kirsch EG, Die Theorie der Elastizitaet und die Beduerfnisse der Festigkeitslehre. Zeitschrift des Vereines deutscher Ingenieure, Vol. 42, pp. 797-807, 1898.